We have more than a handful of games to look at on the Tuesday NBA betting slate. A few of the lines still aren’t out yet for these match-ups, but I’m jumping on a few of the early lines that are released. The Spurs (23-15) have been riddled with injuries all season long. Kawhi Leonard is still out, but SA is healthy apart from him right now. Tony Parker and Tim Duncan will both be suiting up for this game. 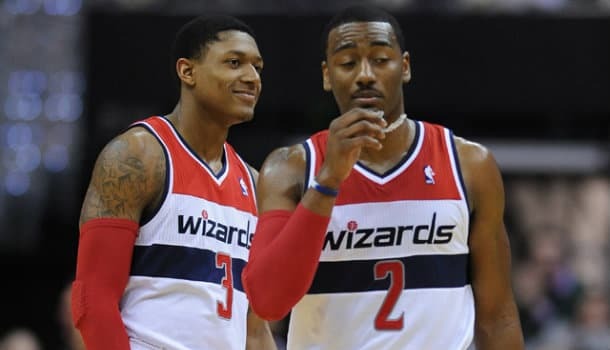 Washington (25-12) is a contender in the East this year thanks to the great play of John Wall and the depth that this team has. The Wizards entire starting rotation can put up big numbers any given night. In this match-up I think the home-road splits will come into play. The Spurs are just above .500 (10-9) on the road this year whereas the Wizards have put up an incredible record of 16-4 at home. Hilario is healthy and playing much better as of late plus his minutes are up. He’ll do a good job keeping Duncan contained in the paint. This is a small spread and the Wizards will want to prove them can win. The Warriors (29-5) are the best team in the NBA thanks to Curry and Thompson. Both shooters are knocking down the deep ball at an excellent rate and they’re easily the highest scoring guard duo. Utah (13-25) is dealing with some injuries this season and because of that they won’t contend. Burks is out for the season and Ingles is starting. He’ll have no shot at trying to cover Thompson in this game. No team scores more than GSW (109.2 PPG) and they only allow 98.2 PPG (11th). They also average the most assists (26.8 APG) and they’ve been holding their own in the paint as well (45.1 RPG – 7th). The Jazz hold teams to under 100 PPG, but that’s about all they’re doing well. The offense has had a few streaks where they’re knocking down everything, but the Jazz are too inconsistent. With the talent on the Kings (16-21) you’d expect them to have a better record. Cousins and Gay are both elite players. Cousins is leading the Kings in points scored (23.9 PPG) and rebounds (12.3 RPG). Collison is also a great little player at PG and he has really proven that this season now that he’s seeing consistent starter minutes. The Kings average 102.2 PPG (11th), but they give up 103.7 PPG (26th). Dallas struggles on defense as well (102.5 PPG – 23rd), but they score more (108.8 PPG = 2nd). Dallas is a very good team and their starting rotation is amongst the best in the NBA this season. The Kings always underachieve and I’ll be betting on the Mavericks to cover ATS. Chandler is going to cause problems for Cousins in the paint and if you shutdown Cousins the Kings will have no chance. I’m also interested in the Suns tomorrow night depending upon the line. Lebron James isn’t likely to suit up and the Suns are a good team, especially at home. If the line is good I’ll take the Suns ML. I’ll be back later in the week with more NBA picks and picks for the two conference championship games in the NFL this weekend. It’ll be a big weekend with the NFL, so come back for my picks.